This letter was sent to ST Forum on 9th May 2011. 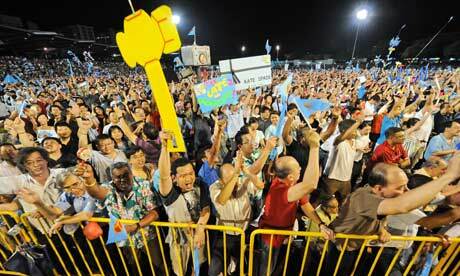 It is a commentary on the many letters and articles in the press concerning what the PAP would have to do following the 6th May 2011 election, when the PAP encountered an unprecedented amount of anger and discontent. Itwasn’t published. Nonetheless, ideas need to find voice somewhere. Hence this posting. Too much has been said about what the PAP will need to do after these elections to address their slippage in the polls. For me, the more important question is not what Singapore’s leaders can do to bolster PAP’s standing, but what they can do to strengthen Singapore’s political system in an increasingly pluralistic society. There was a strong wish on the ground for alternative voices in parliament. On that tide, 6 opposition members of parliament were voted in. As the country matures, it is not inconceivable that the electorate will want a multi-party system, indeed a system where it will be possible for government to pass from one major party to a key opposition party without danger to the nation or the polity. Such a progression may indeed be inevitable. Hence, it is necessary that Singapore’s political system be reformed/transformed to allow the growth of opposition parties who not only contribute to debate, but can also be in a position to form a shadow cabinet and a viable alternative government. Singapore today is led by the PAP. It may seem presumptious to ask the leaders in the PAP to consider reforms which may make it easier for them to share power and perhaps even one day lose it. After all, the raison d’etre of political parties is to gain and stay in power, not give it away. Still, if our leaders are truly long sighted; if they truly understand the inevitable forces leading not just to growth but decay in power groups; if they can see objectively what is best for the growth and stability of Singapore over the next 50 or 100 years, I urge them to consider what they must do if they wish this type of responsible and credible opposition to grow. Building such a base for a smoothly functioning multi-party system is a worthy legacy for PM Lee to leave for our children and our children’s children. It will really mean that our leaders are committed to Majulah Singapura, not Majulah PAP. I hope that this can be an agenda item in our leaders’ upcoming deliberations. Agree fully with you, and disappointed that it was not published. Indeed, the work now is for all those who serve our nation, to work together to ensure the survival of our little red dot. It’s not about protecting their own turf i.e. incumbent vs opposition, but about protecting our nation.